For the Spanish dish, see Spanish omelette. For the Mexican and Central American maize (corn) tortilla, see Corn tortilla. For the South American tortilla, see Sopaipilla. A flour tortilla /tɔːrˈtiːʲə/ (or wheat tortilla to differentiate it from other uses of the word tortilla, which in Spanish means "small torta", or "small cake") is a type of soft, thin flatbread made from finely ground wheat flour from Mexico. Originally derived from the corn tortilla, a bread of maize which predates the arrival of Europeans to the Americas, the wheat flour tortilla was an innovation by exiled Sephardi Jews who considered corn meal as non-kosher and used wheat brought from Europe, while this region was the colony of New Spain. It is made with an unleavened, water based dough, pressed and cooked like corn tortillas. In Spanish the word "tortilla", without qualification, has different meanings in different regions. In Spain it is an omelette; in Mexico and Central America it is a corn tortilla; and in many other places a flour tortilla. Flour tortillas are commonly prepared with meat, mashed potatoes, cheese and other ingredients to make dishes such as tacos, quesadillas and burritos (a dish originating in the Ciudad Juarez, Chihuahua, Mexico / El Paso, Texas area). Tortillas are also very similar to the unleavened bread popular in Semitic, eastern Mediterranean and southern Asian countries, though thinner and smaller in diameter. In China, there is the laobing (烙餅), a pizza-shaped thick "pancake" that is similar to the tortilla. The wheat flour tortilla is probably best known as the tortilla and it is used to make burritos, amongst other things. 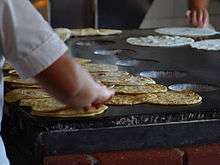 Wheat tortillas have also become a staple of the peoples of northwestern Mexican states (such as Sonora, Sinaloa and Chihuahua). Tortillas vary in size from about 6 to over 30 cm (2.4 to over 12 in), depending on the region of the country and the dish for which it is intended. In commercial production and even in some larger restaurants, automatic machines make tortillas from dough. According to Maya legend, tortillas were invented by a peasant for his hungry king in ancient times. The first tortillas discovered, which date back to approximately 10,000 BC, were made of native maize with dried kernel. The Aztecs used a lot of maize, both eaten straight from the cob and in recipes. They ground the maize, and used the cornmeal to make a dough called masa. On 22 April 1519, Spaniards led by Hernán Cortés, also known as Hernando Cortez, arrived in what is now Mexico. They found that the inhabitants (Aztecs and other native Mexican peoples) made flat maize bread. The native Nahuatl name for this was tlaxcalli. "This city has many public squares, in which are situated the markets and other places for buying and selling. . . where are daily assembled more than sixty thousand souls, engaged in buying and selling; and where are found all kinds of merchandise that the world affords, embracing the necessaries of life, as for instance articles of food. . . maize or Indian corn, in the grain and in the form of bread, preferred in the grain for its flavor to that of the other islands and Terra-firma". This bread made from maize was later given the name tortilla (little cake) by the Spanish. In parts of southern Spain, the origin of many of the Spaniards conquering America, a tortilla or tortillita is a crisp, thin, circular, fried cake made of chickpea meal. These tortillas, which apparently have their roots in southern Spain's Arabic heritage which Arabs brought Spain from Greek foods, look strikingly similar to the fried maize tortilla (or tostada). Franciscan friar Bernardino de Sahagún described how the Aztec diet was based on maize, tortillas, tamales and a wide variety of chiles. Sahagún noted that the Aztecs not only used corn in their tortillas, but also squash and amaranth, and that some varieties used turkey eggs or honey as a flavoring. Traditionally, maize tortillas were made from nixtamalized maize; kernels were soaked in a solution of lime (calcium hydroxide) and water to remove their skins; this also increases the bioavailability of then-unknown niacin. The grains were then ground into maize dough (masa). A golf ball-sized piece of dough was patted down by hand into a thin pancake shape, placed on a hot griddle (comal), and cooked on both sides. This tortilla-making process is still used today in southern Mexico. To meet the needs of big cities and the modern lifestyle, the traditional process was mechanized to increase production of tortillas. 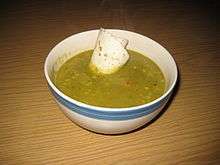 In the 1940s and 1950s, one of the first widespread uses of small gas engines and electric motors was to power wet-grain grinders for making masa. A hand press or hand patting were still used to form it into tortillas, but by the 1960s, small-scale tortilla-making machines could produce cooked tortillas every two seconds. Today, personal and industrial (Mexican-style) tortilla-making equipment has facilitated and expedited tortilla making. Manually operated wooden tortilla presses of the past led to today's industrial tortilla machinery, which can produce up to 60,000 tortillas per hour. Tortillas are now not only made from maize meal, but also from wheat flour; home-made and store-bought tortillas are made in many flavors and varieties. Maize tortillas are naturally low in fat (approximately 2.5 grams for a typical size) and sodium, and provide calcium, potassium, fiber, iron and B vitamins. Tortillas remain a staple food in Mexico and Central America, and have gained popularity and market share elsewhere. In the U.S., tortillas have grown from an "ethnic" to a mainstream food. They have surpassed bagels and muffins, and have now become the number two packaged bread product sold in the U.S (behind sliced bread). The Tortilla Industry Association (TIA) estimates, in the U.S. alone, the tortilla industry (tortillas and their products – tortilla chips, tostada shells and taco shells) has become a $6 billion a year industry. The wheat flour tortilla has different origins from the traditional maize tortilla. However, the acceptance of the wheat tortilla has increased so rapidly, it now is also part of the basic diet in northern Mexico. Wheat flour tortillas have been used on many American spaceflights since 1985 as an easy solution to the problems of handling food in microgravity and preventing bread crumbs from escaping into delicate instruments. The word "tortilla" in these countries is used to refer to the ubiquitous corn tortilla. made of maize. In Mexico burritos are made with wheat tortillas. Honduras is well known for using wheat flour tortillas to make baleadas, which consists of a wheat flour tortilla, folded in half, with various items (beans, cream, scrambled eggs) put inside. Maize and wheat tortillas can often be found in supermarkets in El Salvador and Costa Rica. In Northern Mexico and much of the United States, "tortillas" mean wheat-flour tortillas. They are the foundation of Mexican border cooking. Their popularity was driven by the low cost of inferior grades of wheat flour provided to border markets and by their ability to keep and ship well. In Guam, it is called titiyas and it is paired with kelaguen mannok. "Tortilla art" is the use of tortillas as a substrate for painting. Tortillas are baked and then covered in acrylic before they are painted. The culture of Latino artists is represented by tortilla art, so this is an important part of tortilla history. This kind of art, though, is not quite famous throughout all of Mexico. Tortillas in Central America sometimes differ somewhat from their Mexican counterparts, although are made similarly. In Guatemala and El Salvador, the tortillas are about 5 millimeters thick and about 10 centimeters in diameter, just like Mexican gorditas. Like the Mexican tortillas, the maize is soaked in a mixture of water and lime (or lye), then rinsed and ground. In El Salvador, they sometimes use sorghum (called maicillo there) to make tortillas when there is not enough maize. Also in El Salvador, there is a particularly large and thick tortilla called a "chenga" on top of which food is placed (like a disposable plate, but is edible) to serve food to the labourers in coffee plantations and farms. Stuffed tortillas known as pupusas are also a famous dish of traditional Salvadoran cuisine. Tortillas are widely used in the United States, in recipes of Mexican origin and many others. They are commonly used in burritos. As a testament to their popularity, the Tortilla Industry Association (TIA) estimated Americans consumed approximately 85 billion tortillas in 2000 (not including tortilla chips). Tortilla chips — made from maize tortillas cut into wedges, then fried — first gained popularity in the 1940s in Los Angeles, California. These chips were mass-produced there, but are still known as Mexican food. The ingredients in maize tortillas are maize, lime, and water. Fried chips add salt and vegetable oil. Some alternative ways tortillas can be eaten in the United States include combinations such as beans and meat, apple cinnamon and sugar, or peanut butter and jelly. The results of such alternative uses are often referred to as "wraps". Flour tortillas are also used to make fajitas, sandwiches, casseroles and stews, and hot dogs, and there are numerous other uses. It is not as common to have home-made tortillas in American homes as in Mexico. Many people from northern Mexico and some Mexicans in the southwestern United States eat tortillas as a staple food. Many restaurants use wheat flour tortillas in a variety of non-Mexican and Mexican recipes. Many grocery stores sell ready-made tortillas. ↑ Calderón, Sara Inés. "Tex-Arcana: What's the history of tortillas?" San Antonio Express-news. 02 March 2008. Retrieved 11 October 2015. ↑ Rubios, Fresh Mexican Grill. ↑ Hernán Cortes: From Second Letter to Charles V, 1520, From: Oliver J. Thatcher, ed., The Library of Original Sources (Milwaukee: University Research Extension Co., 1907), Vol. V: 9th to 16th Centuries, pp. 317-326. ↑ Canfield, Lincoln. University of Chicago Spanish Dictionary, 4th Edition. ISBN 0844278521. Introduction. ↑ "Tortilla Statistics and Trends". Aibonline.org. Retrieved 2012-08-06. ↑ Food For Space Flight NASA. Retrieved: 2012-09-08. ↑ California Mexican-Spanish Cook Book; Selected Mexican and Spanish Recipes, by Bertha Haffner-Ginger, Citizen Print Shop, Los Angeles, 1914. ↑ Tackling the taco: A guide to the art of taco eating, by Sophie Avernin, Vuelo Mexicana. ↑ "Cultivarán el maicillo para producir miel: 8 de Agosto 2005 .::. El Diario de Hoy". Elsalvador.com. Retrieved 2012-08-06. ↑ "Ortega Flour Tortillas". Ortega. ↑ Ramona's Spanish-Mexican Cookery; The First Complete and Authentic Spanish-Mexican Cook Book in English, by Pauline Wiley-Kleemann, Editor, West Coast Publishing Co., Los Angeles, 1929.